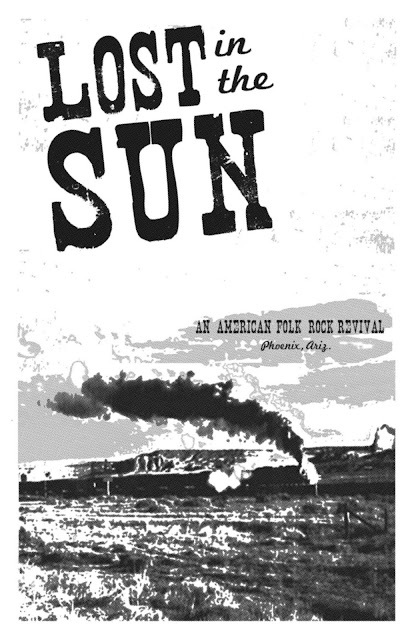 My friends Kelly and Kevin have a great band in Phoenix called Lost in the Sun that I'm doing a promotional poster for. Kelly wanted something with trains and here's the design I came up with. I'm going to do a two-color screen print as soon as I find some good paint. I want to do something with desert colors since, y'know, they're in the desert. In other news, it's springtime in Vermont and it's snowing. A blizzard! At least the Christmas tree that's been sitting outside my front door for months is hidden under some snow again. I really should do something about that soon.